The boy does all the translating and bargaining, including the details of what the job involves. And he lies, telling the contractor that his grandfather is a gardener. After brief directions, grandfather and grandson are left to work alone. When the contractor returns, the two are shocked and ashamed to learn that they had pulled the ice plants and left the chickweed. When the grandfather catches the boy in his lie, he says: “We do not lie for work.” The grandfather promises to rectify the error for free, and the contractor implies that, because of his integrity, there will be more work for him. Himler’s artwork is lovely. His soft, light-filled watercolors, using a muted palette of mostly autumnal colors, reminds me of Matisse’s Impressionistic use of light and space. The artist uses the wash to give the impression of being outdoors, of light shining off trees, specks of water on grass, shadows on clothing. The faces are not detailed; they’re felt rather than seen. Children will be drawn to his work, which I happen to like; but all this is apparently unimportant. The faceless workers are irrelevant to the story except for providing the setting of men standing around, waiting for work or when one of them tries to force his way into the contractor’s truck. While the lack of cultural markers marginalizes the workers and trivializes their desperation, impoverishment and hopelessness, the art both softens the difficulty of their lives and reinforces the concepts of ignorance and backwardness in ways that the words don’t. Both art and words come together to create a fake scenario to make Bunting’s point. Reviews of A Day’s Work, for the most part, have been uncritically positive. According to Booklist, for instance, “The family drama captures the universal immigrant experience in which the child must help the adult interpret the new world, while the wise adult still has much to teach the child about enduring values.” And the book was named a 1994 Américas Commended Title from the Consortium of Latin American Studies Programs. When I was in the third grade and studying California Indians, by some quirk of fate, when it came my turn to read aloud, it was a paragraph labeled “Digger Indians.” Next to the paragraph was a picture of a child, kneeling in the dirt with a stick in his hand. I learned that “digger” meant that they dug for worms and insects to eat, and, they were Cahuilla. My family is Cahuilla. I was never so humiliated in my life. I could barely speak and the teacher had to prompt me to “read louder.” I tried to pretend that I was not related to that child, but I knew that I was. I tell you this story because I know in my heart that this is what children whose fathers are day laborers, or Mexican laborers for that matter, will feel when they read this book. The problems in A Day’s Work may not be as traumatic as seeing your family digging in the dirt for food, but for children whose families do manual labor or speak only Spanish—the humiliation is the same. 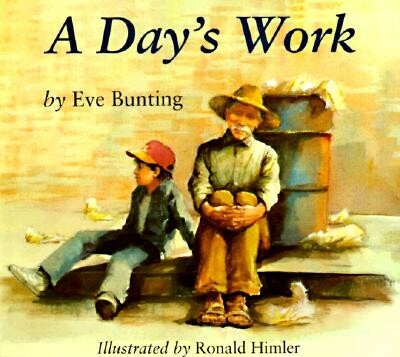 Bunting has made a career out of writing “multicultural” picture books that use poor and immigrant people as backdrops for cautionary morality tales. In Bunting’s picture books, there’s no insight as to why people leave their home countries, their linguistic and educational backgrounds, or their dreams and aspirations. There are no issues to deal with, other than the fact that the grandfather doesn’t speak English, because Bunting doesn’t see any. In her shallow worldview, the exploitation of day laborers, the backbreaking work for little money with no job security, the immigrant-bashing and English-only legislation, the laws being enacted against migrant and immigrant workers, the threat of la Migra at every turn, aren’t real to her because they don’t have to be. Bunting’s a one-trick pony. We get no sense of the people in her stories; they are there merely as a watercolor wash to her morality tale. Unreal scenario. No Mexican mother in her right mind would thrust a young kid into the all-male world of day laborers, where their language would be improper for children to hear, and where strangers pulling up in cars and trucks all day would present a real danger for her child. It’s just not done. But since the protagonist of this story has to be a youngster to fit the picture-book template, and Bunting has crafted the theme to be about honesty and hard work rather than danger, she seems to have no problem with ignoring this reality. Location, location, location. Since the story takes place in Los Angeles, Francisco would know that the ice plant is the plant of choice for open areas, and, unless he’s never been in a car or anywhere else, he would not mistake it for a weed. But again, because Bunting’s theme is solely about the value of honesty and hard work, she seems to have no problem inserting a stereotype about Mexicans who have no observable skills and can’t tell a plant from a weed. An aside: ice plant, while not native to Southern California (it was imported from Australia) is a succulent, thick-skinned and containing liquid, like many plants found throughout Mexico, and if it is taken for anything, it would be the cactus family. Unreal reaction. In any event, a contractor who discovered that his over- and under-age workers have pulled out the desirable plants and left the weeds, would probably, at the very least, fire them on the spot—without pay. Since it’s the habit of many contractors to cruise pickup areas for this exploitable cheap labor, it would be highly unlikely, after such an error, for the grandfather to be rewarded for his “honesty.” The contractor would certainly make him redo the work, for nothing, then never hire him again. Or, maybe there really are nice guys out there, and I’m way too cynical. Inappropriate language structure. When Francisco talks with the contractor, he speaks perfect American English. Yet, in translating for his grandfather, Francisco speaks in a way that’s literal and stilted; this lack of contractions would normally indicate that a language is newly acquired. And when he speaks with the other workers, it’s even worse: “My abuelo, my grandfather, does not speak English yet.” Clunky translation aside, since the grandfather and the workers are all Mexican, why is it seen as necessary for a Mexican child to speak for his Mexican grandfather in English to people who speak Spanish? Is it too much to say it in proper Spanish, then translate it into proper English so the reader knows what he is saying and can give us a sense of people being able to speak their own languages? It seems that the author is confused about Spanish fluency or what it is to be bilingual—even though her story is all about language! Unreal again! The contractor hires Spanish-speaking day laborers, yet he doesn’t speak or understand Spanish. In fact, Bunting presents fluency in Spanish as not only unimportant, but actually a hindrance. The contractor is furious because neither the grandfather nor the grandson can tell a weed from a desirable plant—not because the contractor could not communicate with the grandfather, but because the grandfather could not speak or understand English. Migrants from Mexico speak with each other in colloquial Spanish, and in communicating with contractors, most know at least enough English to be understood. And most contractors have at least a rudimentary working knowledge of Spanish, enough to tell the workers what the day’s work entails. Or they stick with English speakers. In A Day’s Work, except for two sentences, the workers don’t talk; they just hang out, “grumble,” and “shuffle around.” And they litter. Children want to see their fathers as deserving of dignity and respect, and there’s nothing worse than to be ashamed of themselves and their parents. Mexican day laborers work very, very hard, struggling to feed their families here in el norte or in their home villages in el sur. Many day laborers are without documents that legally permit them to live here, and daily, risk having their families torn apart by raids and deportation orders. Bunting’s dysconscious refusal to acknowledge the economic desperation of these migrant workers is also a refusal to acknowledge the danger of being an “illegal” on this side of the border. A few words about the cover, the first thing that children will see: An elderly man and a boy sit next to each other on the curb of a sidewalk. They do not interact. The man, whose gray hair is covered by a straw hat, wears pants that are frayed at the edges with huaraches on his feet. He sits with hands clasped around his knees, body turned inward. He faces forward, eyes half closed, staring into nothing. Behind him is an overflowing garbage can, and next to his feet lies a large piece of garbage. Several other pieces of garbage lie on the ground behind the two, but the larger pieces are closer to the man than to the boy. The boy, whose dark hair is covered by an LA Lakers cap, wears a denim jacket, denim jeans, and tennis shoes. He faces away from the elderly man and away from the garbage can. His arms are spread out behind him and his legs are spread in front. He looks off into the distance, his eyes wide open. So here are old and young, tired and energetic, traditional and modern. Some questions: Why are the man and boy surrounded by garbage? Why haven’t they picked it up? Why aren’t the man and boy interacting? Why is the boy looking off in the distance? Is he looking to the future, open to new experiences? Away from his family? Away from his community? Away from his language and culture? Away from the garbage? My only guess is that, embedded in the cover, together with the interior artwork and the text, is this subliminal message: Learn English or die, sucker! It creeps me out. In the guise of a story about the “universal immigrant experience” whose primary focus is a moral lesson about honesty and the importance of the work ethic, what young children and their teachers will get from A Day’s Work is a romanticized, trivialized, disparaging, and distorted glimpse into the world of hard-working Mexican migrant day laborers. Not recommended.